Fireplaces may be an expensive inclusion, but they cost even more to add later on. Not only will they add value when it comes time to sell, but in the meantime, you can cosy up in front of the fire and enjoy some time on your tablet or reading a book. If you have the money, consider installing a bathtub – a jacuzzi is a great option for this – as well as a low-flow toilet which will use significantly less water. You’ll find that as you get older, it’ll be easier to shower without having to get in and out of a bathtub all the time. With this, you’ll never dread getting out of the shower in winter again. It’s the perfect way to get that spa feeling without ever having to leave your own home. 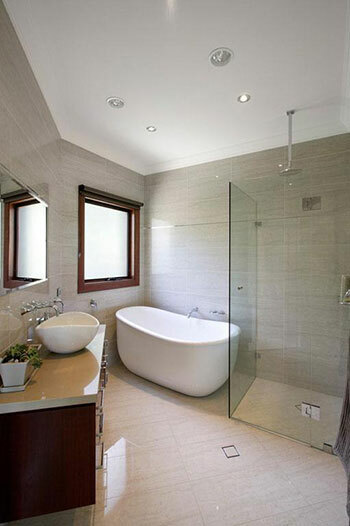 An ensuite master bathroom, if possible with two sinks, will make your home worth a lot more when you’re ready to sell. A walk-in closet in the master bedroom can add value to your home, because it means more space for more clothes and better organisation. To most people, it also has connotations of status – a walk-in closet feels like a luxury only few can afford. It’s a well-known fact that kitchens (and bathrooms) sell houses. New, state of the art kitchen appliances will save you from replacement costs in years to come, as well as increasing the value of your home when it comes time to sell. Mount a pot-filler tap on the kitchen splashback to make it easier to fill a large pot. Potential buyers who love to cook will appreciate the little details that make their lives easier. For a stylish and beautiful kitchen, opt for granite countertops. While a new and workable kitchen is desirable, future prospective homebuyers will also want an attractive looking space. A kitchen island offers more room to put food on, more storage space for appliances and utensils, extra seating, and above all, it makes the kitchen more organised. Double-paned windows and doors are more energy efficient – an increasing concern for potential homebuyers. You could even make some of the money you invest in them back through savings on energy bills or rebates. A roof’s construction and insulation can influence the temperature inside the home. Installing a low-maintenance and long-lasting roof may be expensive, but it’ll also save you more money in the long run in terms of reducing your heating and cooling costs. A beautiful roof will also boost your home’s curb appeal. You can set a thermostat to switch off after you leave the house and switch on before you get back home. This way, you won’t have to spend extra money on heating and cooling the house when it’s empty. A programmable thermostat also means lower electricity bills. If you install radiant floor heating at the building stage, it is not as expensive as it sounds. It can be installed under ceramic tiles, concrete, and timber floors. With radiant heat emitted from the floor via hot water or electrical wires, it not only heats up the floor, but also warms up a room. Most importantly, it is one of the exciting details that buyers can’t resist. When building the siding of your house, be sure to invest in adding insulation for comfort and energy efficiency. If you’re going to tile a basement bar area, your kitchen splashback, or the bathroom, a $2 tile can look just as attractive as a $10 tile. This means you can add value to your home without spending a fortune. Built-in shelving costs more and takes long to make. So consider using freestanding pieces – not only do they add storage space and interest to a room, but they can also be moved around to suit yours, or your potential buyer’s needs. Use visually-appealing light fixtures in one or two main areas of the home and use basic light fixtures in other rooms, like canister or track lights. Features like pendulum lights can add a wow factor to bedrooms or dining rooms. If the entertainment room is going to be mainly used for relaxing or partaking in hobbies, skylights can provide warmth and also offer natural light that can help save on energy costs. They will also add value to your home as skylights are seen as a luxury perk. Adding extra power outlets is a great way to future-proof your home. We are using more electronic gadgets all the time and more tech-savvy buyers may see a lack of power outlets in spaces like the living area as a no-no, especially given as they are more difficult to add at a later date. Build a ceiling that is 10-foot tall or higher, as this will help open up a room, especially in small spaces. Whether or not you have a car, a large garage means more storage space and more room for hobby activities, and will always be an advantage when selling your home. If you have an expensive wine collection, turn the basement or pantry into a climate-controlled wine cellar to protect them and add value when you resell your home. A wine cellar will make your home seem that much bigger and better organised, even if it’s inside a pantry or basement space. This can help protect the items in your home and give you a sense of security. An electric alarm system has many key features, including sensors for windows and doors, motion detectors, and a warning siren or light.